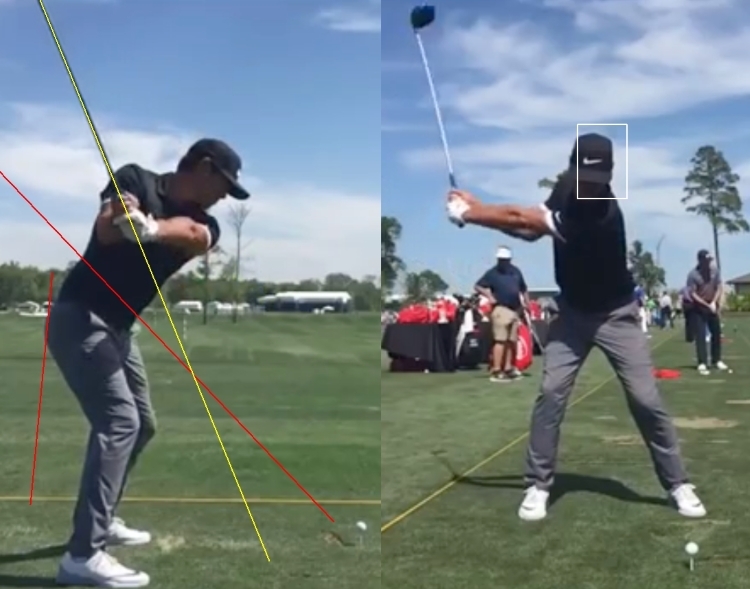 It’s very well known that a big difference between tour pros and the rest of golfers is how consistently a tour pro hits the middle of the clubface compared to other golfers. So what does that have to do with putting distance control I hear you ask? Well, if you’re an average golfer on say a handicap between 10-20, then one big reason is because you miss the middle of the clubface more than you hit it with long shots. This same pattern will carry over to putting and consequently to distance control. 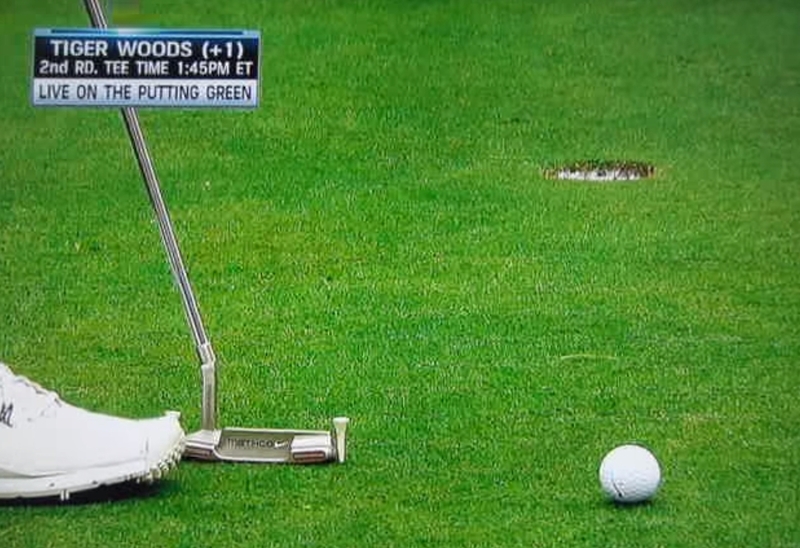 So if you have too many 3 putts because you hit putts too short or too long…. you can do as many drills as you want on the practice green to help with this problem, BUT… you need to address the root of the problem first. And that root cause is a lack of hitting the center of the putter face. So, if you’re not a very good putter then you should work on hitting the middle of the putter face. There’s a number of different ways to do this, but there’s one popular way that a pretty good golfer has practiced for a long time. And that’s Tiger Woods practicing his drill of putting through a gate of tees. Something else you can get is sweet spot putting clips. Or you can make something like that with rubber bands. The point of this article is to get you focusing on hitting the middle of the putter face first. Then you can work on doing drills to improve your distance control. 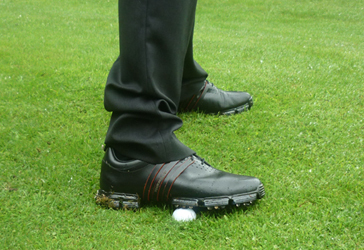 Many golfers only ever do distance control drills on the putting green and never improve. And the reason they never improve is because they never improve hitting it out of the middle of the clubface. So go to it, and work on hitting the ball out of the center of the putter face and your putting will improve. Then use that same principle with chipping, then pitching etc. etc. There’s little things you can do that over the long term will drop shots from your scores. Today I’m going to share one of those little things with you and I bet you’ve never done it before. You see, it’s well known for golfers to stand behind their ball on the putting green and visualize their ball rolling into the hole. But I have a unique twist on doing this that will help you to hole more putts. HOWEVER, you will need to practice this on the putting green to get used to it, because you would have never done it before. To do this, here’s what I want you to do. On the practice putting green putt a ball in the hole or place the ball in the hole. Doesn’t matter what you do. Just the ball needs to be in the hole. Once the ball is in a hole then study it. Take a real good mental image of that ball in the hole. Next I want you to pick the ball out of the hole and place it 3 feet from the hole. Then go through the same putting routine you’d use on the golf course for this length of putt. But on the last look at the hole I want you to imagine the ball already at the bottom of the hole. Then I want you to visualize the ball coming out of the hole and rolling perfectly along the line to your putterface. Right where the ball is. As soon as your eyes come back to the ball then putt and send the ball on the line you’ve just seen. This might seem odd at first, but give it a try and I’m sure you’ll find you hole more putts incorporating this little mental change into your putting routine. I want you to think back to your last 10 games of golf. Were they mainly in the 90’s? Were they in the 80’s or 70’s? Whatever the average was, I’m sure you’d like to score lower. But there’s one thing that if you don’t understand can stop that, no matter what you try to do technically to improve your golf game. Your brain loves to keep things the same. That’s why golfers have one good nine followed by one bad nine… TO KEEP THEM AT THEIR LEVEL! That’s also why golfers have one bad nine followed by a great one. That’s why golfers will often have a great round going and blow up the last 4 or 5 holes. See, your mind loves familiarity. If you see yourself as a 90’s shooter then that’s what you’ll always be… UNLESS you do something different. That’s why golfers buy new golf clubs. 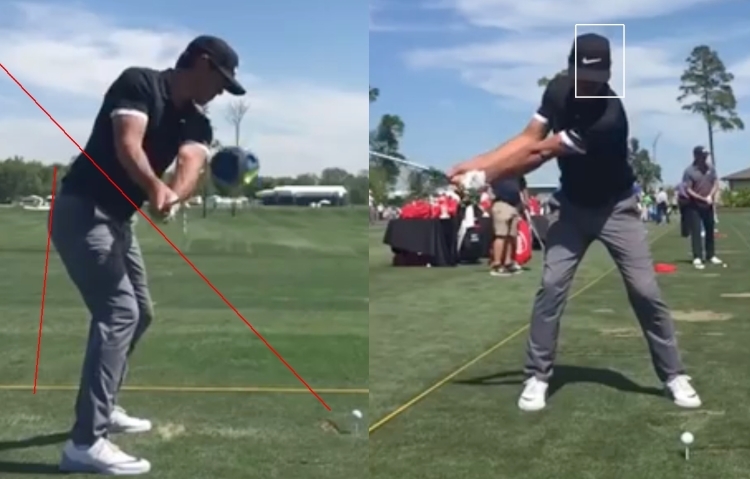 That’s why golfers try to improve their swings. That’s why golfers practice more. While a lot of those things can certainly help golfers to lower their scores… they won’t make a big difference until the golfer starts to see themselves as an improved golfer. I’m talking about long term improvement progress here. Any golfer can have a hot day and burn the course up. But over 10 games you’ll see an average and that will determine your level of play. How can you move into a different scoring bracket? Well, obviously this is a mental issue. It’s a mental issue that’s causing you to play great one nineand crap the next. Now what I’m about to give you is a long term solution. It’s things that you need to do day after day to program your mind for your new “normal”. Tip 1 – Spend 5 minutes relaxing and with your eyes closed imagining yourself playing a game of golf and playing very well. After each hole, see yourself writing down a good score. Your good round should put you into a new scoring bracket by about 5 shots. So if you normally score low 90’s then visualize scoring high 80’s. You’ll need to do this daily. It will take time for you to change your scoring belief. Tip 2 – Get a scorecard from your course and every day, write down a good score for you on each hole, then total it up. Do this with pencil so you can rub it out and do it every day. After you write down your score get excited about the good score. Really feel happy about your great score. Write this down every day 20-30 times. There you go, that’s 3 tips to help you start to break your mind familiarity trait. You will need to do this consistently for agood month or two. Don’t do this once, play a game, notice nodifference and give up. What I’m talking about is your average score. Everyone has a bad game. Everyone has a good game. Your average score determines your handicap and level of play. And to change that you need to change your perception of yourself as a golfer. Wasn’t that an awesome final round of the 2018 PGA Championship? Best major of the year in my opinion. Of course, it helped with Tiger Woods surging up the leaderboard on the final day. But how rock solid was Brooks Koepka under the pressure?! First we’ll start by looking at how Brooks sets up to the golf ball. Just by his setup it looks like he’s going to crush it. Brooks has a very athletic, ready to explode setup. There’s a few things I just want to point out. 1. He has quite a lot of knee flex at setup. 2. He has quite a strong grip, and I’ll show you how that affects his swing later in this analysis. 3. 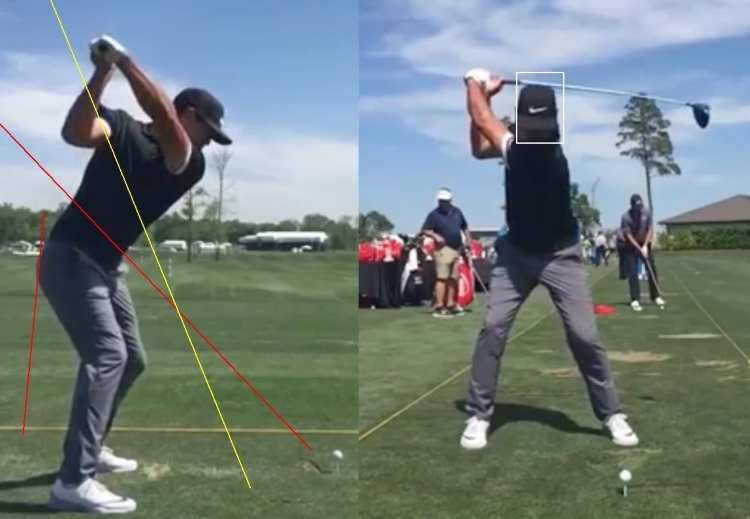 Brooks is a long hitter and one thing long hitters do is tee up the ball very high and have the ball positioned a long way forward in their stance. Plus, they have wide stances to give a solid platform to explode. Brooks does all of these things, as you can see. One thing I want you to notice at this point in the analysis is the distance between his knees at setup. There’s a lot of space between his knees. Brooks has a nice wide take away as you can see above left. He takes the club away on plane with his hands but the club head is outside. I have heard him talk about how he does that on purpose to help him hit a power fade. 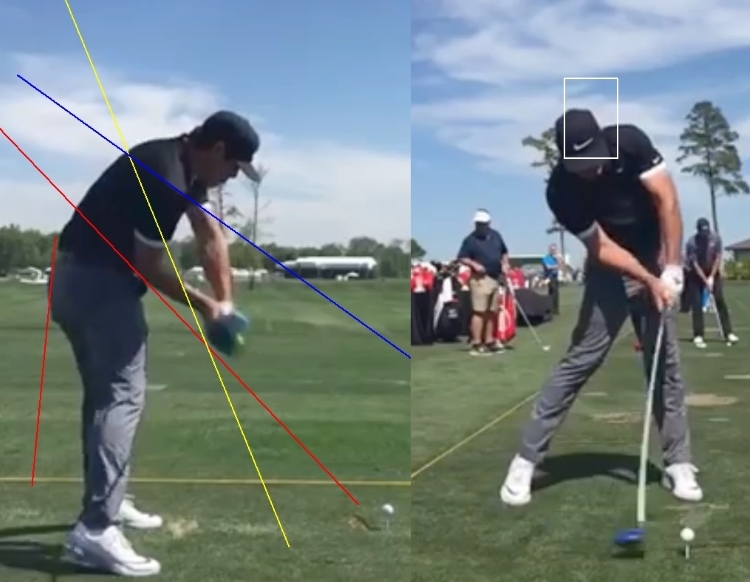 Notice how closed the clubface is and how much outside the clubhead is from the hands. Again, he is doing this on purpose to hit a power fade. It seems counterintuitive to have a closed clubface in the backswing to hit a power fade but a lot of the golf swing is counterintuitive. 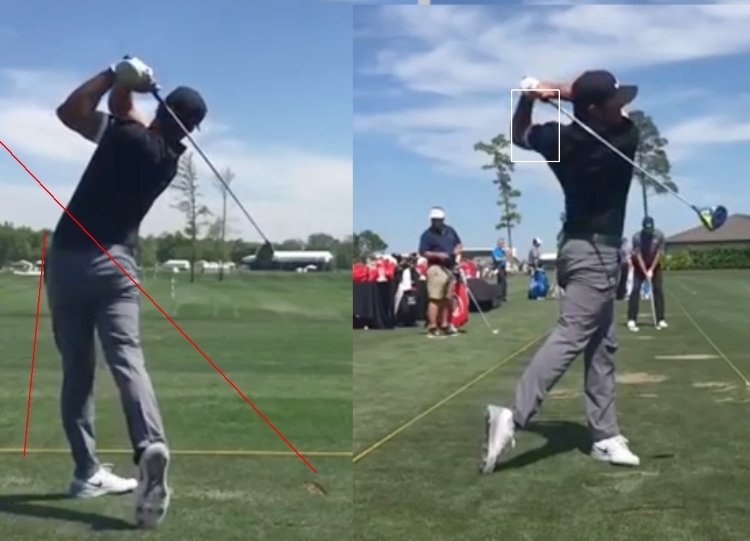 Now let’s look at the half way point in his swing to see how his shaft plane is. The clubshaft is quite vertical at this point in the backswing but if you err on one side or the other in the backswing, you should have the club shaft more vertical in the backswing. This is the opposite of what most amateur golfers do. Most amateurs take the club back too flat and then come down too steep. At the top of the backswing Brooks has a very closed clubface. 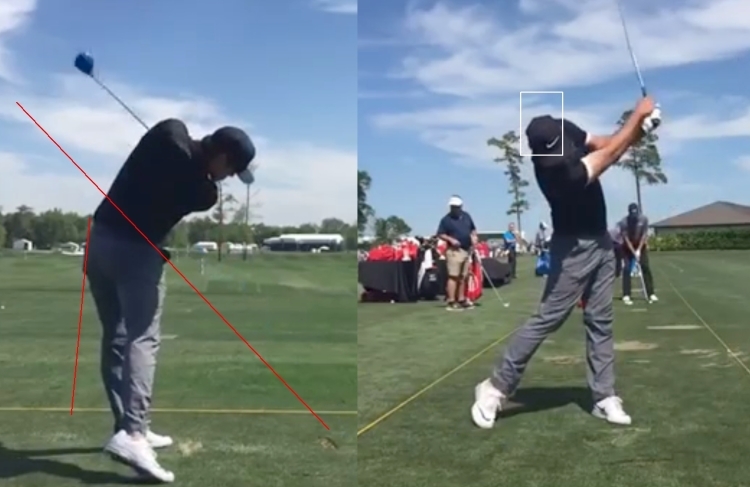 It’s a great top of the backswing position though and one thing to note is the distance between his knees has largely stayed the same from setup to the top of the backswing. His knees have moved very little. You need to be very flexible to be able to do that and still make a full turn. Speaking of that… his turn with his shoulders is not massive. If he let his knees go a bit more he could turn further, but there’s no point in doing that with his length. 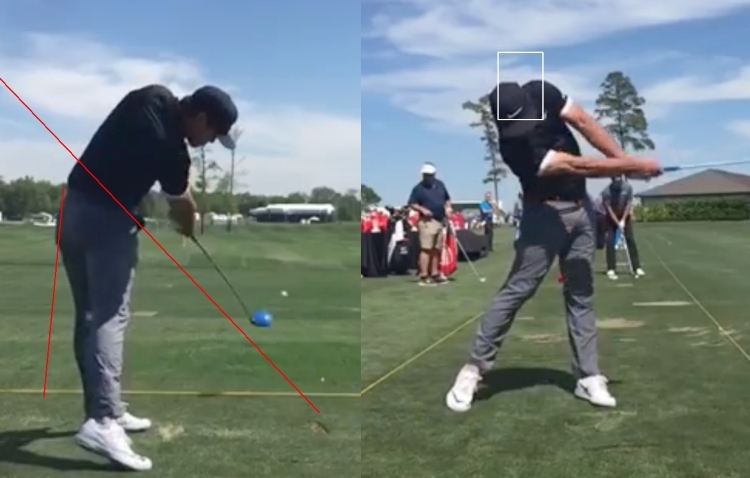 Remember I mentioned how his backswing plane was quite steep? Well, unless he shallows the plane a lot in the downswing he would be a terrible ball striker. Of course he’s not, so check this shallowing out…. That’s some serious shallowing of the club shaft. Check out the blue line compared to the yellow line. 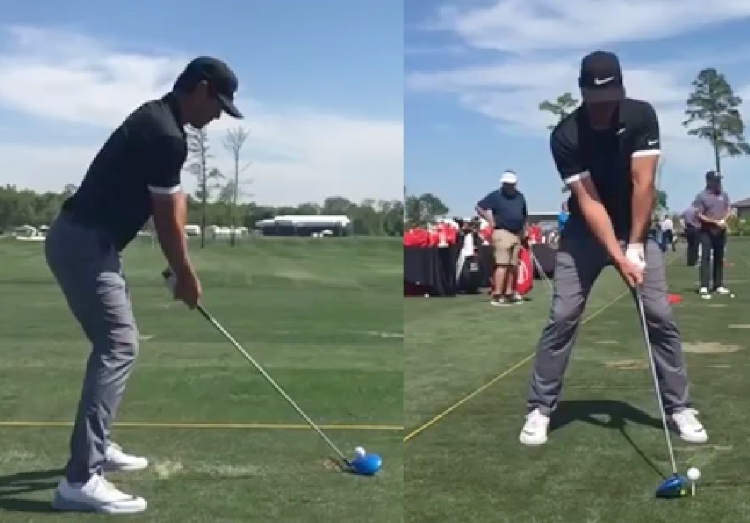 If he came down on the same plane as he went back you would have never heard of Brooks Koepka. 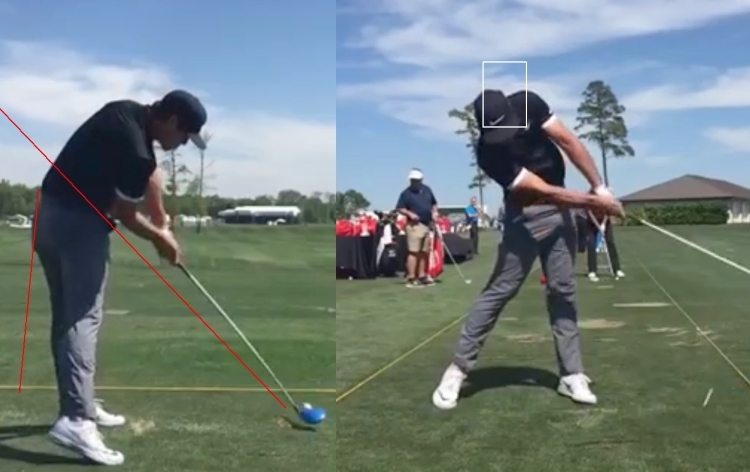 When the club is parallel with the ground (left pic above) you can see that he is back on plane with his hands and club. The clubface is closed which it should be to hit a power fade. He wants the ball to start to the left. You can see in the pre-impact picture that he is leading with the hands and his head is slightly behind where it was at address. Look at the image above of impact. You can tell the ball is starting left. He has maintained his tush line. 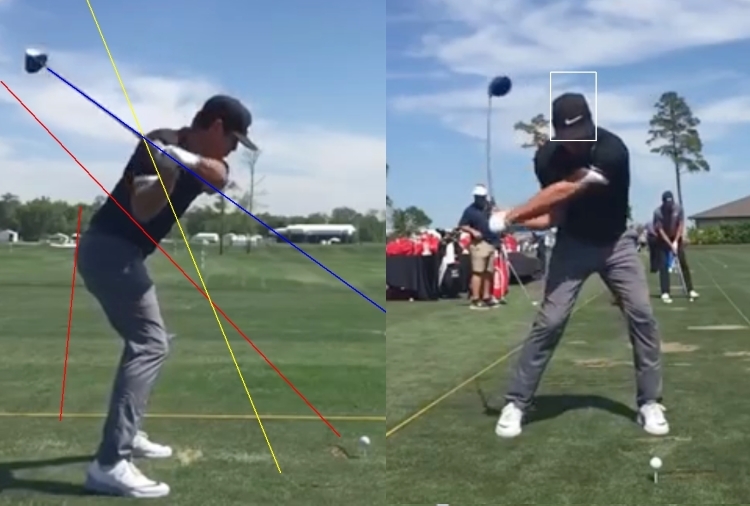 Then in the picture of post impact you can see there is very little forearm rotation. The clubface is not flipping over, which will lead to consistent power fades. Look at how he is still maintaining his tush line and how he is keeping down with his head. This is allowing him to swing more down the line rather than around. Even at this stage in his swing he has his head down and he’s still maintaining his tush line. You have to be very athletic and flexible to do that! What a great finish. He has maintained his tush line right the way through the swing until the end. Simply awesome. I really like Brooks’ swing. He has proved it holds up well to major pressure. I believe he will win more majors. He seems to get himself up a notch for them. Not a bad trait to have! So what’s the big take-aways for you when looking at Brooks Koepka’s swing? Well, there’s a couple of important things. 1st. Work on maintaining your tush line throughout the swing and you’ll hit more consistent golf shots. 2nd. 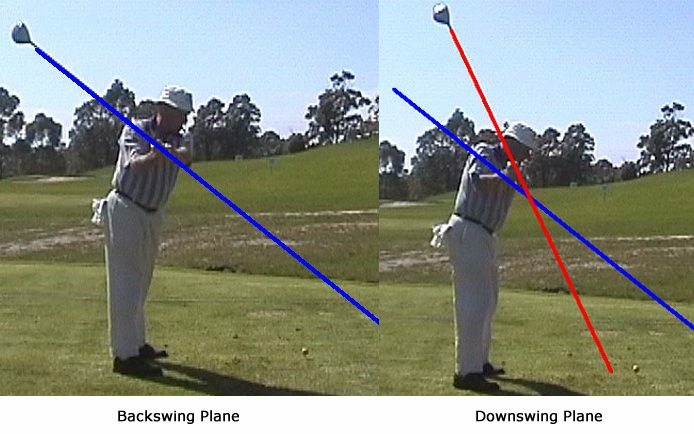 If your swing plane is too flat on the backswing and then too steep on the downswing like this…. If you don’t do that then you’ll always struggle with your ball striking. Then your poor swing plane is probably the major reason why. But you can fix it. And when you do you’ll hit the ball so much more consistently than ever. If you don’t fix it you’ll always struggle with your ball striking. Don’t let that happen. Go here and get the 3 Easy Steps To A Pro Swing plane program. Over this past year I’ve purchased and tested over 20 drivers from different companies. One of the main reasons is that nowadays you can go on Youtube and see reviews of any driver quickly and easily. However, I would question the “unbiased nature” of many of those reviews, because most of the reviews are by people who have been given the club for free. Even if there is no intention to talk up a product, there is by default a hidden code not to trash a product you’ve been given for free. I could have gone to the golf companies and got free drivers to do reviews, but I didn’t want to do that because that’s what everyone does. There’s nothing different in doing a review on a driver you’re given for free. If you’re given something you have no investment in it. So if that’s the case, why did I buy 20 drivers? I did that for you! From my experiment of hitting different driver after different driver I quickly found that if you hit a good shot with ANY driver it will go as far as any other driver. So if that’s the case (and it is!) how do you choose a driver that is going to help lower your scores. Look. You must like the way a driver looks when you pick it up. If a golfer doesn’t like the look of a driver from the get go, I think most golfers will struggle with that driver. There’s always exceptions to any rule however. There will be golfers somewhere that will have a driver they don’t like the look of that they enjoy hitting. But with drivers at their legal limits I don’t see a point in having a driver like that. 2. Sound. I think sound has a big part to play in whether you like a driver or not. I don’t particularly like the sound of Ping drivers so I don’t gravitate to them. A lot of players like that high pitch ping sound but I’m not one of them. 3. Feel. This can encompass a lot of different things. It can be the feel when you’re holding the driver. It can be the feel of the ball being struck. It can be the feel of the driver as you’re swinging it. 4. There’s no perfect driver! From my experiment of hitting many different drivers I quickly found that there is no perfect driver. Even if you have a driver that you like the look of, sounds great and feels good, you will still hit bad golf shots. So don’t write a driver off after a couple of bad shots if it fills the 3 previous criteria. With all that being said, you hear stories of golfers picking up 20 yards with a new driver. So if drivers are at their legal limits how can that happen? 3. 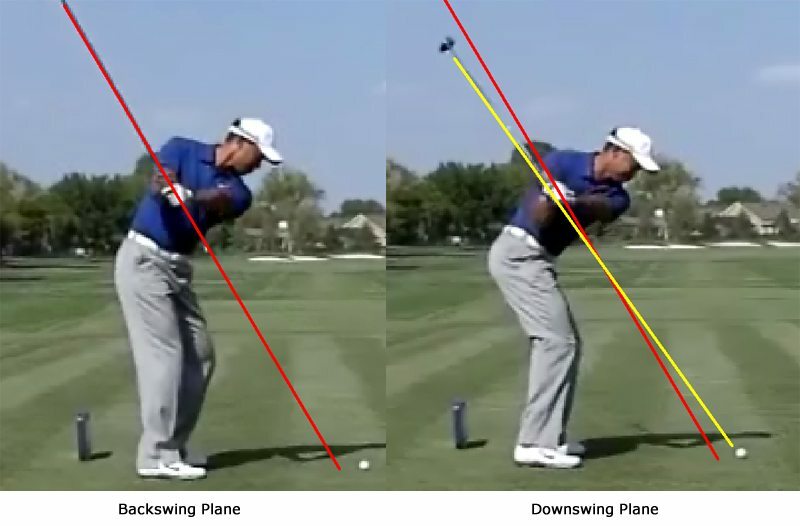 Improved angle of attack. It’s been very well documented that if you hit a modern driver more above the center of the clubface and slightly on the toe then a ball will go a lot further than if it’s hit lower on the face. 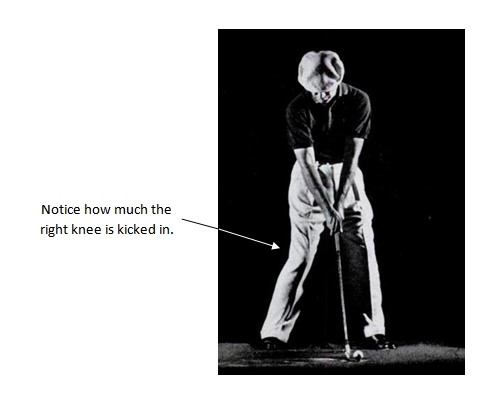 It’s also been well documented that if a golfer has a low launch angle and they get that up then (can often be done by an increased loft on the clubface. And what a loft says on the club is often not true) they will hit the ball further. And it’s been well documented that if a golfer goes from hitting down with a driver to hitting up on a driver then they will gain a lot of distance. 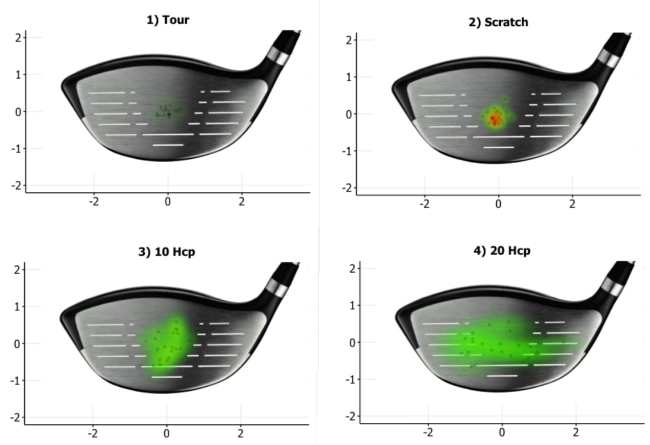 So if a golfer is hitting a driver low on the face with a low launch angle and hitting down on the ball, and then they do the opposite with a new driver they will gain heaps of distance. 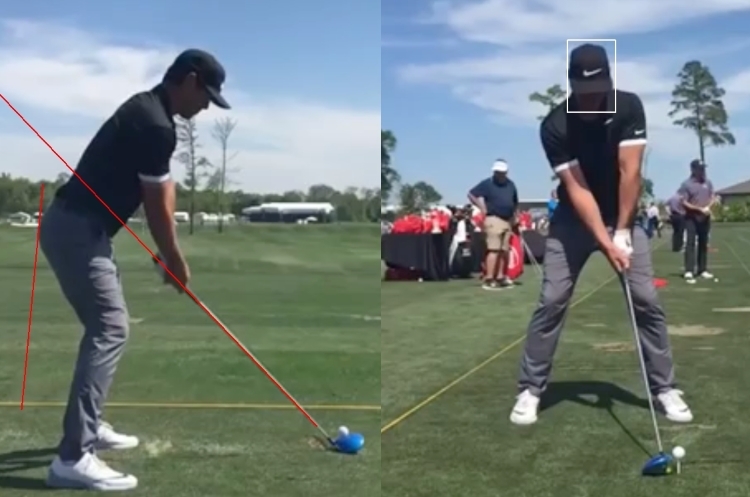 The question then is… can hitting a different driver actually help a golfer to do that? The answer, from my experiment is… YES! From the 20 drivers I hit I narrowed the drivers I liked down to 5. All the drivers were the same in terms of legal limits but the 5 drivers I liked helped me to get better numbers on the launch monitor. Because I liked the way they looked, I liked the way they felt, I like the way they sounded. Those things all combined to help me get better numbers. I have no idea why “scientifically” (apart from a club loft being different on different drivers even though they are all supposedly the same loft!) but that’s what happened. The reason I gave you that big long introduction is because I don’t want you to ever get sucked into the marketing that these companies bring out. Drivers are at their legal limits! If you hear of golfers gaining yards with a “new” driver it’s because of those golfers changing their impact conditions with a new driver. There were two Callaway Epic driver models. 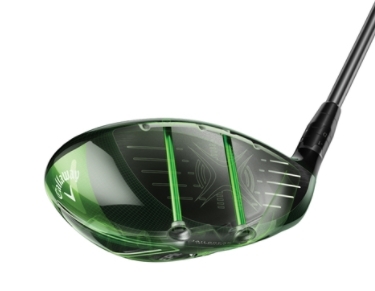 The first was the Callaway Epic and the second was the Callaway Epic sub-zero. I purchased both of these drivers and they do actually look quite different. 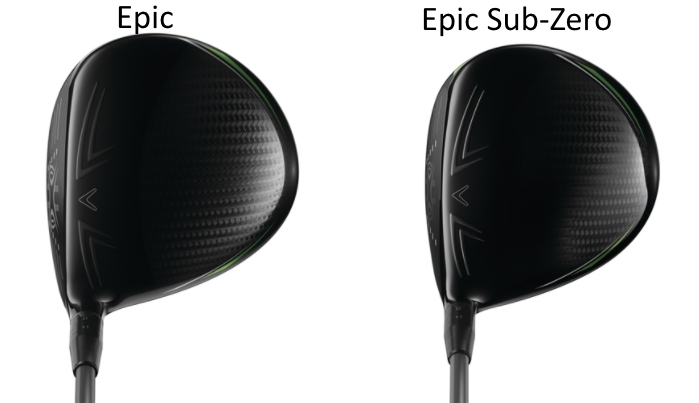 I thought the Epic driver was much rounder than the Epic sub-zero. I just didn’t like the look of the Epic diver at all from the get go. Then I hit it and it just seemed to have a hook bias for me. I quickly gave it up because of that. And that raises another interesting point about driver testing. Generally speaking, a good golfer can hit a driver 3 – 5 times and tell whether they like it or not. That’s probably a good bench mark for your driver testing as well. Hit 5 shots with a driver and see if you like it. If not, move on. You don’t need to buy 20 drivers. Just go test different drivers to see if you can find one that beats your current gamer in terms of looks, feel, sound, forgiveness and of course, distance! Ok, so I quickly ruled out the Epic driver because I didn’t like the look of it, the way it sat and it felt like it was going to turn the ball over. So the rest of this review is going to be on the Epic sub-zero driver. As far as looks is concerned, I loved the way it looks. It looks fantastic. There’s heaps of stuff on Jailbreak technology on the net. But in short, it’s simply a couple of titanium rods just behind the clubface to stop the club from expanding when it’s hit, and that apparently will help transfer more energy to the ball so a golfer gets more ball speed from the face. So all this Jailbreak technology is meant to do is increase ball speed when you hit the driver. When you play golf you do so on the golf course, you don’t play on a launch monitor. So I took this driver out to the golf course and tested it against my current gamer driver. And in my on-course testing I found this driver to be comparable to my gamer driver in terms of distance. It wasn’t any longer, but it was more inaccurate and not as forgiving. All in all, it was an “ok” driver for me but nothing special. The looks were awesome but it didn’t go any longer or straighter than my current driver so I sold it. I guess the moral of this story is… don’t get sucked into marketing B.S. I have heard some golf pros say that this Jailbreak technology is possibly adding a mile or two ball speed for some golfers. Come on, give me a break (pun intended)! If a golfer hits this driver a lot further than their current driver (as long as it’s fairly new) it’s because of improved impact conditions. Nothing more – because drivers are at the legal limits. I found it very interesting buying and testing the 20 drivers over the past year. I understand that not many golfers can do this… and they don’t need to. Remember, when I said that most good golfers can tell within 3 – 5 shots if they like a driver. That’s all you need to do. Go test lots of drivers if you want. Hit a driver for 3 – 5 shots and you’ll know within that time frame whether to explore getting that driver some more. If you don’t like it then move on. Naturally I could have done that, but I wanted to invest something more into this process and spend a long time testing these drivers. I won’t do this ever again but I’m glad I did it, because hopefully it will help some golfers somewhere not to get sucked into marketing hype that some new driver is going to add yards to their drives. As I write this there is going to be a new Callaway driver that will apparently supersede the 2017 Epic driver. I’m not knocking Callaway here either. It’s their business to sell golf equipment. And if you buy a new driver every year that’s fine. But remember, the only way a driver is going to help someone increase distance (as long as they’re using a pretty recent driver) is by improved impact conditions.